Abu Dhabi is home to some rich green desert Oasis. The well known Oases are the Al Ain Oasis and the Liwa Oasis. The oases have been tendered for the past 3000 years and today the palm plantations with a thick cover of vegetation and green splendour proffer a cool haven for the residents and visitors. Liwa Oasis is a green haven of palm forests and agricultural lands a sure shot respite from the scotching heat of the desert land. Liwa Oasis is a 90 minutes drive from the capital Emirate of Abu Dhabi. The oasis is an abode for over 50 villages and 100 kilometers of land. The Liwa crescent contains natural aquifers which provide water for irrigation. Al Ain is another very popular oasis which is also rightfully known as the garden city of UAE. 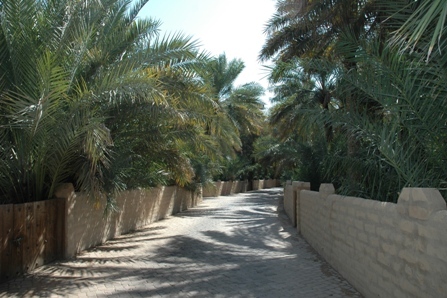 Al Ain is surrounded with date palms, coconut palms, and other palm trees family along with abundant host of trees, desert plants, and flowering plants. The boulevards are decorated with green lines of plantations and gardens attracting exotic insects, birds and animals. There are natural aquifers deep under the ground which avoids ground water evaporation and enables storage of water for usage in the residential areas. The gardens are breathtakingly beautiful with hue of colours playing in the horizon from purple flowers to white, orange, yellow, red, pink and so on. The colours soothe and calm the mind and rest our eyes.